And Turning Up the Heat! How often do you have your car serviced? ls it every 3000 or 5000 miles? How important is it to have good gas mileage? Do you schedule preventive maintenance to avoid costly repairs? Are you concerned about having enough power to plow through the toughest winter days? It's just as important to keep your woodstove system tuned up as it is to maintain your car. Some people think that since a woodstove is heavy, rugged and burns wood it doesn't need maintenance and will last forever. This isn't necessarily the case. A woodstove, like a car, has working parts that need to be replaced from time to time but can last for generations if cared for properly. lf your car blew a head gasket you would immediately take it into the dealership to have it fixed. When was the last time you checked the gaskets on your woodstove? A poorly sealing gasket will let in too much air. Your woodstove is designed to burn with a certain amount of incoming air. Leaking gaskets mean the system is less efficient and the fire cannot be completely controlled. lf the door gasket is loose, sagging or not fitting tightly then it's time for replacement. Try this test: when the fire is out, open the stove door and Place a dollar bill between the door and the stove. Close the door. Pull the dollar bill out. lf the dollar slides out easily, the gasket should be replaced. lf the gasket surrounding the glass in the door seems loose or has disappeared, it's important to replace it. This "tune up" will save you frustration, money and the time spent in preparing and loading extra firewood. Have you ever noticed the diameter of the tailpipe on your car? lt's pretty small, isn't it? lf the exhaust pipe was too large or too small the engine would not perform properly. The exhaust system for a wood stove also must be the correct size. For air to flow through the stove it has to be pulled by draft, which is dependent upon the air temperature difference between the flue and the outside atmosphere. lf the flue is too large the draft will be slow initially because there's a large area to heat. A flue sized to meet the wood stove requirements will increase the efficiency and performance of the stove. For instance, if the stove has a 6" outlet and was vented into a large flue, installing a 6" insulated stainless steel chimney liner in the flue will make it work as intended. You will also have greater control over the draft and fire. Just as how you drive your car effects the gas mileage, how you burn your stove will determine how often you need a chimney cleaning, how far your wood supply will go and the performance of the system. 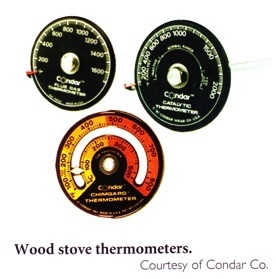 The best tool you can get to measure burning efficiency is a woodstove or flue gas thermometer. How do you know you're burning hot enough? Do you know when it's too hot? Using a woodstove without a woodstove thermometer is like trying to drive your car without a speedometer. By burning in the correct temperature range you will get the most out of your woodburning dollars, burn at a higher efficiency and the flue will be cleaner when your chimney professional does the annual maintenance cleaning. Burning temperatures below the correct range create dirty smoke from the exhaust and more costly cleaning as the chimney professional may have to haul out special tools to clean the excessively dirty flue. Burning too hot may damage the stove. So make sure your woodstove system is ready for winter. Take some time now and call your chimney professional to get this maintenance done. You will not only be saving money and resources now, you will also be protecting your investment for years to come. ldeas" published by Creative Homeowner. Reprinted, with permission, from the August 2011 issue of The Chimney Sweep News, an independent trade magazine for chimney service professionals. Jim Gillam, editor/publisher. 541-882-5196.